Dawn has a deep love for the home and daily rhythms, as can be seen through the quotidian objects she recovers and overlays with meaning, giving them a new lease of life, often charged with moral and political messages. 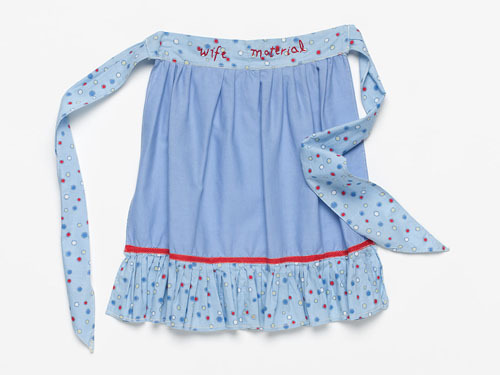 Take the banal tea-towels that become a critique on society, via the textual and visual adaptations Dawn lends to them. 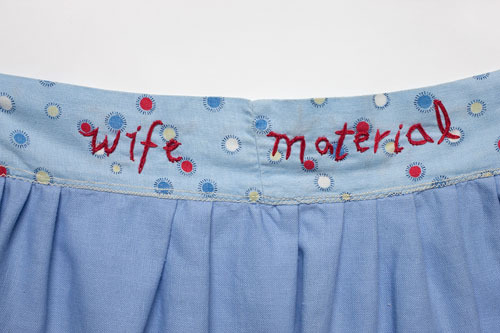 Napery, crockery, clothing and other familiar daily objects are the foundation stones of her work. She views all of humanity as a form of family, with Earth a communal home, and uses these as subjects for treatment in her artworks to communicate how she interprets individual and collective human impact on one another, and our environment. Interdependence of the individual and the whole and, similarly, that of mind and body provide a key to her work, much of which is sculptural. 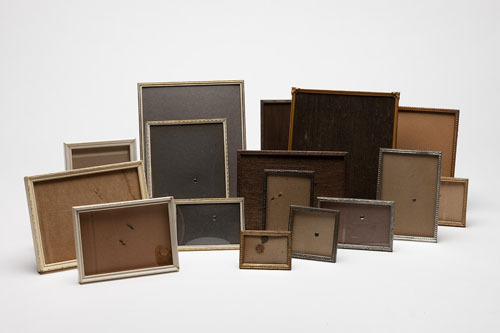 Frequently constructed to present no ‘right’ side to the viewer, the aspect of different perspectives, or multiple readings, is added to through Dawn’s predominant re-use of existing materials in creating her pieces. She gives consideration to the message already being conveyed by the nature of the reclaimed material (she is loathe to use synthetics) and its pre-existing imagery and form, and engages these inherent symbols as a part of the overall work. Use of text in the work, and the title, adds meaning or acts as a frame. Dawn’s love of science and art, her curiosity about life, interest in yoga, Buddhist philosophies, that of biodynamic farming, permaculture and sustainable approaches to living all contribute to, and nurture, her art practice. Current Diploma of Engineering Technology – Jewellery. NMIT. 2007 Diploma of Anthroposophical Studies. Melbourne Rudolf Steiner Seminar Ltd.
1996 Doctor of Philosophy (Immunology). Monash Medical School, Monash University. 1989 Bachelor of Science (Hons 1). Monash University. 2008 Expressions 2008: The Wool Quilt Prize, National Wool Museum, Geelong. 2006 Lexicon, Gallery @ City Library, Melbourne. 2004 Expressions 2004: The Wool Quilt Prize, National Wool Museum, Geelong. 2004 Real. Not Real, artroom5, Adelaide. 2003 Linden Postcard Show 2003, Linden St Kilda Centre for Contemporary Arts, St Kilda. 1999 Doll, Artspace, Adelaide Festival Centre, Adelaide; Object Galleries, Sydney, Pt Pirie Tourism Arts Centre, Pt Pirie. 1998 Home is where the art is, Artspace, Adelaide Festival Centre, Adelaide. 2004 Coffin Bay Art and Craft Gallery’s Winter Hat and Beanie exhibition. Two prizes: Most Surprising / Unexpected Hat; Most Innovative Hat. 1989–92 Australian Postgraduate Research Award. 1991 Australian Society for Immunology Student Bursary. 1988 Anti-Cancer Council Vacation Studentship. 2004 Radok, S. ‘Real not real’ The Adelaide Review. 247 (April 2004). 1994 Kanost, D. and McCluskey, J. 1994. ‘Anergic B cells constitutively present self antigen: enhanced immunoglobulin receptor-mediated presentation of antigenic determinants by B cells is hierarchical’ Eur. J. Immunol. 24:1186–1193. 1993 Kanost, D., Basten, A., and McCluskey, J. 1993. ‘Threshold detection of self-antigen/MHC class II complexes formed in vivo: constitutive presentation of an immunodomiant epitope of hen egg lysozyme (HEL) in HEL-transgenic mice’ Int. Immunol. 5(8):893–902.